PREfund founding members with Webster's principal Moraima Machado (back row, far right). In the background, volunteers are painting the original detail in Webster's auditorium. The weather was so awful today I canceled the volunteer mobilization and started phone banking. I also stopped by Daniel Webster Elementary in Potrero Hill, where hundreds — literally! 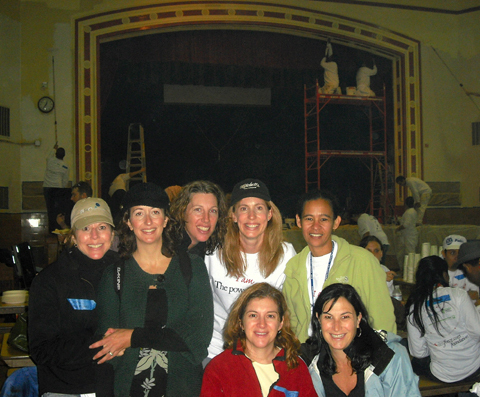 — of volunteers from Salesforce.com were working hard planting trees and painting much of the interior of the school. Webster was on the brink of closing two years ago, when a group of Potrero Hill residents formed the Potrero Residents Education Fund. Since then, this group of amazingly motivated and resourceful moms has opened a Spanish bilingual preschool at the site and written grants to make a number of physical improvements. The formerly under-enrolled school has all but filled its incoming Kindergarten class and opened a Spanish immersion program. Next year, the first of the PREfund children will arrive. Former Mayor and Potrero resident Art Agnos was also on hand today, and took some time away from painting to show me the gorgeous preschool facility, which just opened last month. This entry was posted in Improving schools and tagged PREfund, Webster. Bookmark the permalink.